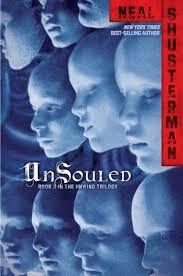 Unsouled, the third book in the Unwind dystology, started off running and hasn’t slowed down yet. The second book, Unwholly, basically left you hanging so unless if you are the type of person who does not need to know how a story ends, or a series in this case, you could skip this book and go about your business never caring what happens to Conner, Risa, Lev, and Cam. I have only ever had one book I could not finish because it was so terrible, and it honestly still bothers me that I couldn’t finish it. It is on my bookshelf, and no matter how much I look at it, I cannot bear to even open it. Risa stays true to herself and lets the whole world know exactly why she turned and became an alleged supporter of the unwinding practice. Cam takes great offense to the brush-off from Risa, just when the public was beginning to accept him for what he was. Conner and Lev? Winging it once again. Coming up with an idea, and running with it. This seems to only work about 50% of the time for these two. Starkey is still on the hunt, determined to take down the Akron AWOL (aka Conner) and take out anyone who gets in his way. He will do anything to make the storked kids come first for once. Oh. And Nelson. The Black Market Parts Pirate? He’s pretty ticked off too since he had the Akron AWOL captured, only to lose him. He also had Lev and lost him too. Kind of makes you wonder how he makes a living on the black market, doesn’t it? There is much more to come, as I am only beginning to get into this book. I am most curious to know if this book is the last, or if there is another one to come! I am trying to be good and not Google for that information, so the end of a book will remain a surprise. What has you tearing through the pages at the moment?